Dreaming of how to pack Europe's top travel thrills and cultural treats into a two-week vacation? You've found it! Your Rick Steves guide will surround you with the art treasures of Paris, followed by a hearty taste of Burgundy, a hike in the majestic Swiss Alps, festive Bavaria, the romantic canals of Venice, Renaissance Florence, a countryside stay in Tuscany, the must-see sights of Rome — and chances to connect with Europeans like you never thought possible. Join us for the Best of Europe in 14 Days! We'll kick off our tour with a “Welcome to Europe” meeting around 2 p.m. at our hotel in Paris. Then we’re off to explore Europe’s greatest museum – the Louvre – where we’ll come face-to-face with the works of Raphael, Delacroix and Leonardo, and timeless treasures that include Mona Lisa, Winged Victory, Venus de Milo and hundreds more. We'll end the day by celebrating the start of our European adventure over dinner together. Sleep in Paris (2 nights). No bus. Walking: strenuous. Let's begin where Paris did, on the Ile de la Cité. Your guide will lead a walking tour to reveal the city's early history, including visits to a pair of the world's most important Gothic churches: the legendary Notre-Dame Cathedral and the exquisite Sainte-Chapelle. Then we'll take a stroll through the bohemian Latin Quarter. The rest of the day is free to visit the world's greatest collection of Impressionist art — from Monet and Degas to Cézanne and Gauguin and more — at the Orsay Museum; be inspired by Monet's incredible Water Lilies at the recently renovated Orangerie; or puzzle over the whimsical water fountains and modern art at the Pompidou. With your included Paris Museum Pass, the City of Light is yours to discover. No bus. Walking: moderate. This morning we'll hop aboard our bus and roll into the French countryside, passing pastures and vineyards en route to the "profoundly French" town of Beaune in the heart of Burgundy. After an orientation walk through the town, and a visit to Hôtel Dieu, the medieval hospital in Beaune, you’ll have the afternoon free to explore the many charms of village France. This evening we'll enjoy a wine tasting followed by dinner together. Sleep in Beaune (1 night). Bus: 4 hrs. Walking: moderate. Today we'll leave the rolling hills of beautiful Burgundy, and climb high into the heart of the Swiss Alps. Our destination is the Berner Oberland's magnificent Lauterbrunnen Valley, flanked by towering, waterfall-laced cliffs and crowned by a trio of Switzerland's most formidable peaks: the Eiger, Monch and Jungfrau. Tonight we'll share a hearty Swiss dinner together at our creaky old chalet in the Lauterbrunnen Valley, where we'll sleep (2 nights). Bus: 5 hrs. Walking: light. The day is all yours to enjoy some of Europe's most dramatic scenery. You may want to join your guide for an optional mountain excursion that combines the local narrow-gauge railway, a gondola lift, and a spectacular Alpine walk above the tree line, surrounded by a panorama of cut-glass peaks...or ride a gondola lift up to the Schilthorn at 10,000 feet, loiter in the thin air, and hike down...or for a more restful day, just wander through the valley and walk to the thundering Trümmelbach: a unique set of waterfalls encased behind the valley walls. No bus. Walking: light to strenuous (your choice). Today's drive is a good time to catch up on your journal, listen to music, curl up with a good book, or just sit back and enjoy views of pristine mountains and sparkling lakes. Along the way we'll find a small town to stop for lunch. Then we'll continue on to the heart of Bavaria to the people-friendly city of Munich, where after an orientation walk together, you're free to savor a traditional Bavarian feast. Sleep in Munich (2 nights). Bus: 7 hrs. Walking: light. This morning we'll be joined by our local guide for a walking tour through the center of Germany's most livable city. Then we'll hop on a bus to explore more of Munich, including the Olympic Park. We'll also stop to tour the opulent Nymphenburg Palace, home to the Wittelsbach dynasty, rulers of Bavaria for 700 years. Your afternoon is free to choose some great options: be dazzled by the Deutsches Museum; rent a bike to explore the sprawling English Garden; or poke around the Marienplatz and Viktualienmarkt looking for the cuckoo clock of your dreams. This evening, feel free to join the party at the Hofbräuhaus beer hall, where you can hoist a liter-size mug of beer, and a pretzel as big as your head. Bus: 1 hr. Walking: moderate. We'll take a scenic, all-day drive to Venice today, stopping en route for lunch together in a characteristic Italian-Tirolean village. At the edge of Venice we'll board a vaporetto boat for an "am-I-really-here?" Grand Canal ride to our hotel in the historic heart of this seductive city. Tonight we'll take an alleys-and-canals orientation stroll to St. Mark's Square. Later, your guide will organize an optional gondola ride for this romantic, uniquely Venetian experience. If the moon is out, it will hit your eye like a big pizza pie. Sleep in Venice (2 nights). Boat: ½ hr. Bus: 8 hrs. Walking: light. This morning our local guide will take us on a winding walking tour through Venice, blending historic and modern-day stories of this one-of-a-kind treasure, and giving us a local's perspective on Venice's fascinating past...and its uncertain future. The rest of your day is free to visit St. Mark's Basilica, the Doge's Palace, or the Titian- and Tintoretto-packed Accademia art gallery. Better yet, get lost (remember, it's an island) exploring the alleys, cruising the canals, and "crawling" the pubs. No bus (too much water). Walking: moderate. 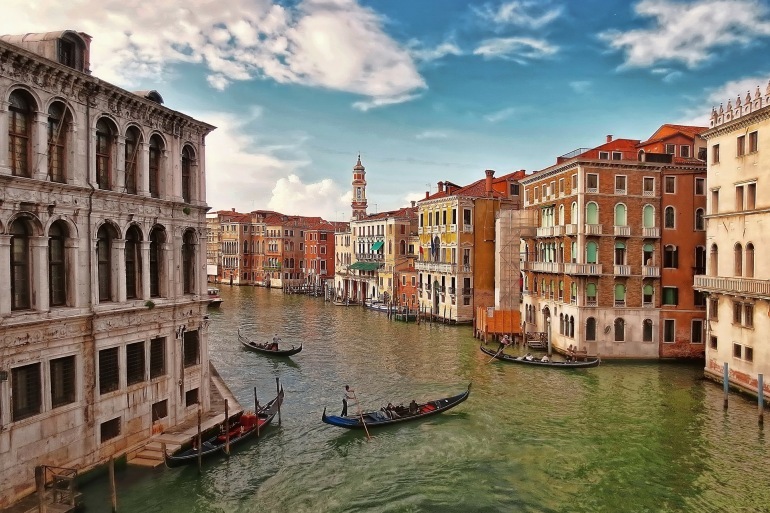 Today we say "Ciao Venezia" as we hop back aboard our bus and drive south into Tuscany. We'll wind our way through the verdant Tuscan hills to our destination: a working family farm that also serves as our country hotel. You'll have free time this afternoon to take a scenic stroll amid the peaceful vines and olive groves, relax by the pool or taste some of our host's family-made wines before we sit down to a hearty Tuscan feast, enjoying a country-style dinner together. Sleep peacefully near Florence in Tuscany (2 nights). Boat: ½ hr. Bus: 4 hrs. Walking: light. We'll drive to Florence this morning, and hit the ground walking with a Renaissance tour of the city's historic center — learning how Brunelleschi's cathedral dome and Ghiberti's Baptistery doors helped define this world-changing era. We'll end our walk at the Uffizi Gallery, home to masterpieces by Leonardo, Botticelli, Michelangelo and more. After some free time for lunch, we'll regroup for a visit to the Accademia Gallery, where we'll marvel at works of sculptural genius: Michelangelo's rough-hewn Prisoners and his greatest masterpiece, David. We'll return to the countryside late this afternoon with plenty of time to relax and freshen up before dinner together. Bus: 2 hrs. Walking: strenuous. This morning we'll drive straight to the heart of Rome. After a quick lunch and a Roman transportation lesson, we'll spend the rest of the afternoon uncovering Ancient Rome as a local guide takes us through the monumental Colosseum, history-drenched Roman Forum, and the awe-inspiring Pantheon. Tonight you may wish to celebrate la dolce vita Roman-style, with an after-dinner stroll through the floodlit heart of the city, lacing together the lively campos, classy piazzas, and splashy fountains. Sleep in Rome (2 nights). Bus: 4 hrs. Walking: strenuous. Today we'll focus on Renaissance Rome. We’ll meet our local guide on the other side of the Tiber river and introduce you to the greatest church in Christendom, the awe-inspiring St. Peter's Basilica, home to Michelangelo's sublime Pietà. Then we’ll take you to the sprawling Vatican Museum, where you’ll see an endless collection of treasures as you make your way to one of the world's most famous works of art: Michelangelo's Sistine Chapel. Your afternoon is free to explore more on your own. Don’t forget to taste some delicious gelato along the way! No bus. Walking: strenuous.